Montana is blessed, or cursed, with highly changeable - and frequently wet and cold - weather. Now, this wet and cool weather is a good thing for trout fishing. After all, no water = no trout. However, for the angler who is visiting Montana for the first time, the changeable nature of Montana's climate often is a rude and unexpected shock. A Neoprene Glove. Even during the summer, these gloves are handy to have and are a necessity during colder weather. See more Neoprene Gloves at Amazon. Yet, the summer weather in Montana often gets surprisingly warm. Many anglers have visited Montana during the summer, expecting chilly temperatures, only to discover high temperatures in the 90's and endless days of sunshine. Because of the variability in Montana's weather, this guide has been prepared to help first time visitors to Montana better determine what pieces of clothing they might wish to bring (or leave behind). This guide is by no means exhaustive, especially since clothing is such a personal preference. Really, I prepared this guide more than anything to help anglers avoid the moment when they say to themselves..."I Wish I Had Brought This"....or "I Wish I Knew This Existed." If you're an angler who wants more detail about general weather traits in Montana, be sure to visit two articles on this website. The first provides information about the General Weather Traits in Montana and the second page goes over What Type of Weather to Expect by Season. Interested visitors might wish to read these two articles to better understand Montana's weather in a broad sense. For some odd reason, I've found many anglers aren't familiar with neoprene gloves. Perhaps this is because neoprene gloves are more often used by kayakers than anglers. Yet, neoprene gloves are the best way to keep hands warm during wet and cold weather while still allowing the angler to have full dexterity of their fingers. During the summer, anglers should consider bringing neoprene gloves, even though the odds of using them on any given day are low. The reason anglers should still have them is simple...if the weather does turn wet and cold, the anglers hands stay warm. And as anyone who has fished in cold weather knows, cold and numb hands aren't a recipe for an enjoyable (or productive) day of fishing. Moreover, neoprene gloves are inexpensive and are a clothing item that can just be tossed in the car and left there until needed. The remainder of the year, neoprene gloves are generally a necessity in Montana. Fly fishing when the weather is 50 degrees or lower without neoprene gloves is an almost certain route to, at a minimum, mildly frost-bitten hands. During winter months, the neoprene gloves will need to be quite thick in order to provide the necessary insulation. For the remainder of the year, generally light and thin neoprene gloves are all that is needed. Neoprene gloves are available in both finger and finger-less styles. Choose which one works best for you and the type of weather you are most likely to fish. Since neoprene gloves are inexpensive, it often comes in handy having both styles of gloves. So consider getting one style of each. Amazon.Com - Amazon probably sells every neoprene glove in existence. Just be sure to buy one that works well for your particular needs. 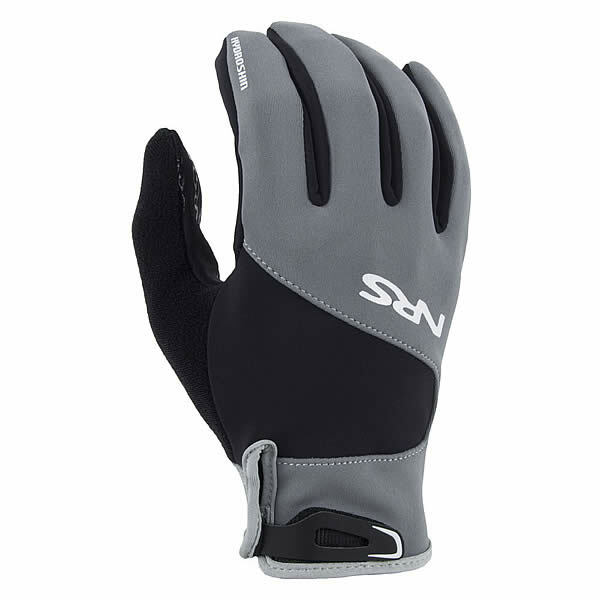 NRS - NRS is also an excellent choice for neoprene gloves. They have an excellent selection of gloves and all of their gear is top-notch. When it comes to "technical" water sports apparel, NRS is the place to to buy it. View Neoprene Gloves at NRS. For summer weather, quick dry clothing should be a necessity. Once an angler discovers the joys of wearing quick dry clothing, they'll never go back to wearing a stinky cotton shirt again. There's several reasons for this. Unlike cotton shirts, quick dry clothing is made of nylon and other synthetic materials. These materials don't act like a sponge, which is what cotton does when cotton gets wet. The result is that these fabrics dry extremely quickly, especially when there's just a bit of a breeze or the sun is out. Secondly, quick dry clothing is wonderful to stay cool on hot days. Where-as cotton absorbs the anglers sweat, keeping them hot and stinky, quick dry clothing allows the sweat to escape - thus cooling the angler. And since the sweat escapes the shirt, the angler also stays "odor free," unlike with cotton clothing. In short, when fishing in hot weather (or for that matter, when doing anything strenuous in hot weather, such as hiking), just say no to cotton. Your body will be thankful that you did. A few years ago, quick dry clothing was difficult to find and not especially comfortable to wear. Today, however, quality quick dry clothing no longer has that "nylon'" feeling but instead often feels like silk, being soft and smooth. 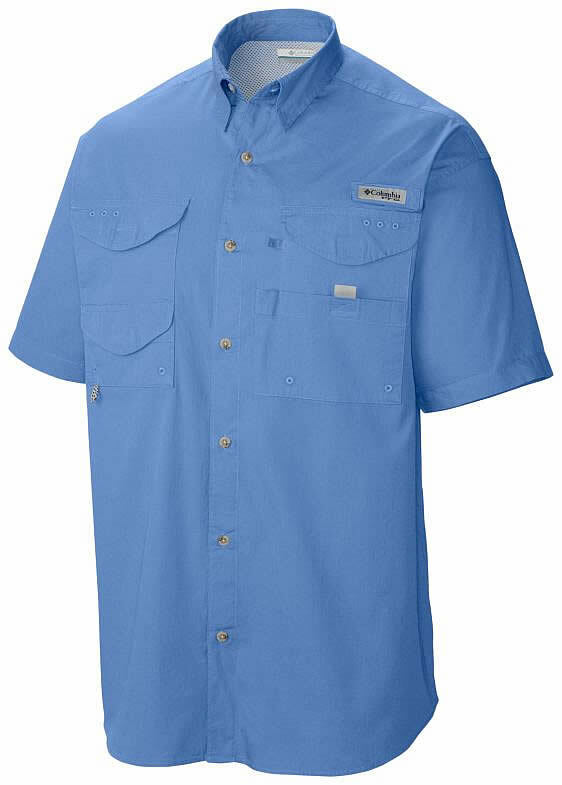 A Columbia Quick-Dry Fishing Shirt. Available in both long-sleeve and short-sleeve versions, they both are superb hot weather fishing shirts. More Quick Dry Shirts at Amazon. And that really is the difference between quality and low-quality quick dry clothing. Low quality quick dry clothing makes that "nylon sound" when a person moves and feels a bit like a nylon tent fabric. By contrast, quality quick dry clothing by Columbia, Orvis and others are smooth, silent and almost silk-like to the touch. For fly fishing, the best quick dry clothing I've found are the various styles of short-sleeve and long-sleeve fishing shirts made by Columbia. I wear these shirts continually during the summer and love them, and they have proven remarkably durable. For fly fishing, these are excellent shirts. They have numerous large chest pockets and a breathable back panel allowing the breeze to enter the shirt. The shirts are also loose fitting and in no way hinder freedom of movement. Lastly, these shirts are also very easy to clean "streamside" if necessary, too. These shirts also work superbly for hiking. The large pockets are perfect spots to stash a small digital camera, cell phone and other small items. And unlike with a cotton shirt, a hiker won't be covered in sticky sweat due to walking up a long hill or carrying a backpack. Columbia is always changing their styles and names of their quick dry clothing, but year after year the performance remains the same. I urge anglers to give them a try. Find a style and color you like and then just buy one. But don't be surprised that if after wearing one for a few days you end up buying more (I own seven of them, in fact). Columbia fishing shirts are best bought at the following retailers. Other retailers will carry a style or two, but these three retailers is where you'll find the largest selection of all styles and colors that are available. Columbia.Com - The obvious place to start shopping for them, since they have all styles and colors in stock unless a particular style is on clearance or closeout. Amazon - Sells the complete line of Columbia fishing shirts. Popular sizes and colors are usually, but not necessarily always, in stock. Cabela's - Sells several styles of Columbia Fishing shirts. However, they often seem to have limited stock on hand of popular sizes and colors. Still, they are worth checking out as I bought my first Columbia fishing shirt from Cabela's. For warm weather, any hat that keeps the sun off the head and face works just fine when fishing. Ball caps, trucker caps, dedicated floater hats...and the list goes on. For anglers who will be camping out during the summer, bring a stocking cap or at least something with a hood. In the upper elevations of Montana, and sometimes in the lower elevations as well, nights can get very cold (from mid-30's to low 40's). A fleece stocking cap or clothing with an attached hood might make the difference between staying warm and freezing at night. For cold weather fly fishing, an insulated hat is a requirement to avoid freezing while out on the water. Assuming it isn't raining, a non-cotton stocking cap (such as a fleece stocking cap made by Columbia or Turtle Fleece) works well. The reason to avoid cotton hats is because they retain moisture and will, over the course of a day, lose most of their insulating properties and sometimes can make the angler colder than if they wore no hat at all. For cold weather, stick with fleece hats. Other hats more tailored to fly fishing, especially those sold by Orvis and Cabela's, also work nicely although they cost more. Uninsulated Rain Jacket : Something to stay dry during the rain. For summer season, a standard gore-tex or similar synthetic uninsulated rain jacket is ideal (and on those periodic colder days, just wear a lightweight fleece shirt beneath the jacket). An uninsulated rain jacket also works very well for off-the-river activities, such as hiking. A quality uninsulated rain jacket also works just fine as an around-town jacket, too. Insulated Rain Jacket : From late-fall to mid-Spring, the weather is generally cold enough to require an insulated jacket to stay warm, both on and off the river. Because of this, it just makes sense to bring a dual-purpose jacket..a jacket that works well both while fishing and when off the water. An insulated rain jacket solves this problem nicely. Just like with a normal un-insulated rain jacket, insulated rain jackets should have a waterproof shell made of gore-tex or similar waterproof synthetic materials. Perhaps another way to phrase it is where can't you buy a rain jacket? Offline, quality gear merchants such as REI and Cabela's all sell excellent rain jackets in their retail stores that are multi-functional, stylish and durable. Online, there's also no shortage of retailers that sell quality rain jackets. Exactly what style, color and accessories that come with the jacket is a matter of personal preference. Whatever you get, just be sure to one that is durable, comfortable and truly multi-functional (after all, you'll likely use this jacket when you aren't fishing, too). And that's just to name a few. Of course, Amazon sells a massive selection of rain jackets, too. Just be sure to buy one that is high-quality and will work well for fly-fishing. Some of the less-expensive jackets sold on Amazon are of, shall we say, "dubious quality." Wading jackets are a clothing item that has little use during the summer month's in Montana. Unless the angler wade fishes at very high elevations in nasty weather, the warmth and protection provided by these jackets simply isn't needed. That all changes, however, during the winter months. During the winter, for anglers who wade fish a wading jacket is a necessity. It should be noted that anglers who fish during the winter months but "float fish" instead of "wade fish" will also have little use for a wading jacket. While they are nice to have for float anglers, they aren't needed. A normal insulated rain jacket works just as well for float anglers, although they will lack some of the pockets and other "niceties" found on a wading jacket. Since wading jackets are a clothing item used almost exclusively by anglers, it should be no surprise that the best selection and best quality jackets are available at fly fishing retailers. Offline, jackets are sold at local fly shops and major retailers like Cabela's. Online, once again wading jackets are sold pretty much only by fly shops. When shopping around for a wading jacket, be sure to check the "clearance" and "close-out" section of their websites. For whatever reason, many wading jackets seem to to end up in the "closeout" and "clearance" sections of many online retailers websites.